This is an old recipe that my Nana copied out from her friend Dulcie, after a successful ‘War Wives Luncheon’ during World War Two. At least that was the memorable annotation she jotted at the bottom of the piece of paper the recipe is written on. As a child I would ask Nana over and over to tell me about that Luncheon in Sydney, and she would remind me how hard it was to make tasty food with all of the rationing and restrictions. Dulcie’s slice had been a real winner. As a child I painstakingly copied the same recipe into the Family Recipe Book. Each time I make this I think of my Nana and her friends, sitting drinking cups of tea, eating slice and chatting during the long days of the War, with the rations and limitations and hardships. There’s a lot of comfort to be had in a cup of tea and a slice. 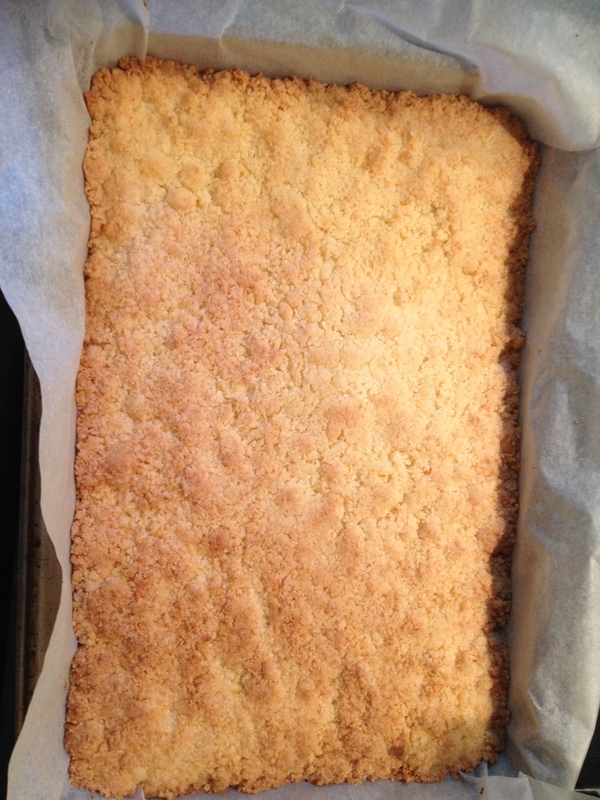 1 x cup of self raising flour (self-rising for my USA friends or 1 cup of all purpose flour, 1 and 1/2 x teaspoons baking powder and a pinch of salt, sifted together), 1 x cup of unsweetened desiccated coconut, 1/2 cup of sugar, 1/2 cup (4 oz or 125 grams) melted butter, finely grated zest of one lemon. *Note – If you’re gluten intolerant, this works fine with a commercial gluten-free flour mix. Line a 28cm x 18cm (7 inch by 11 inch) slice tin with some baking paper. Bake for 10 to 12 minutes, or until the top is nicely golden. 1 x 395g can of sweetened condensed milk, 1/2 cup of fresh lemon juice, pulp of 3 passionfruit. Heat oven to moderate (160 degree celcius fan-forced or 180 degree oven – 350 degrees fahrenheit), and then just before you pop the slice back in, knock the temperature back to 140 degrees for your fan forced oven or equivalent. 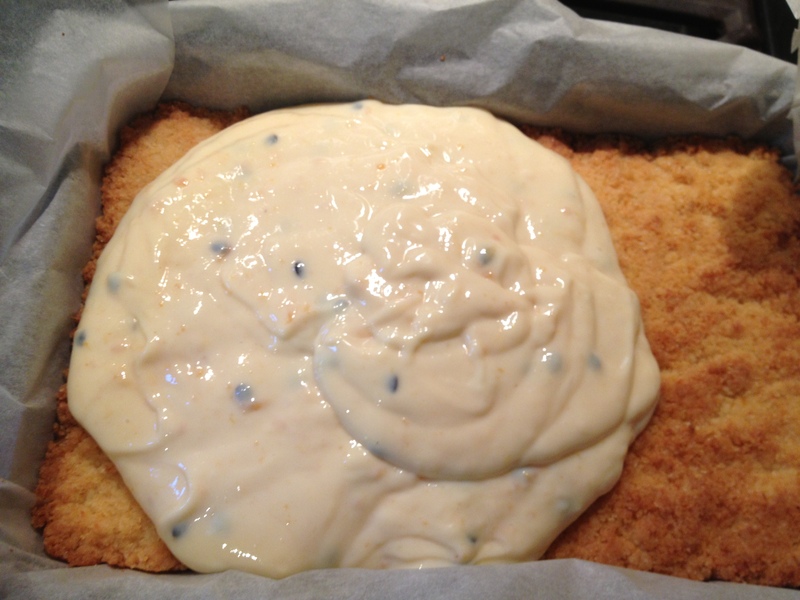 Pour the passionfruit topping over the biscuit base and smooth over until you have a good coverage. Bake in the slow oven for twenty minutes. The topping should be firm to your touch, and pale golden. Remove from oven and cool completely. Store in refrigerator in a hot climate, or if you are not eating this all in one day. To serve, cut into small squares. 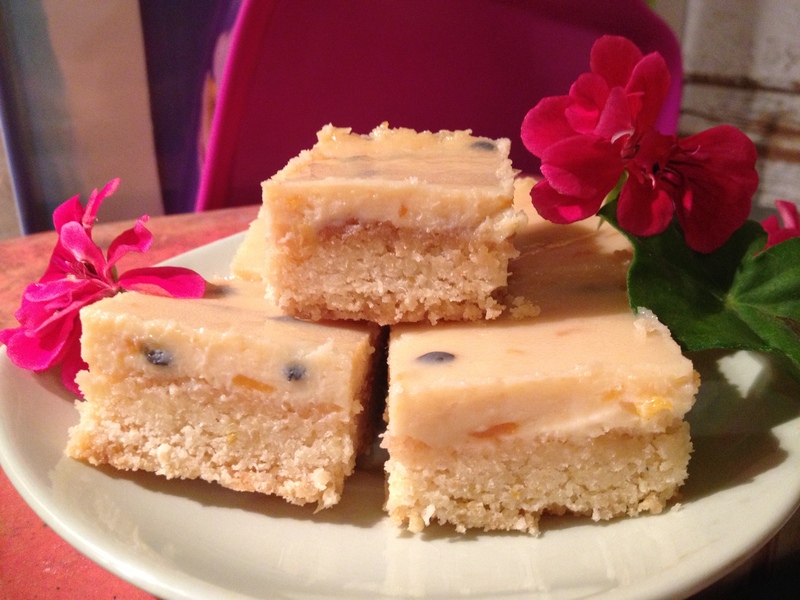 This entry was posted in Cakes and desserts, Gluten-free, Sweet treats and tagged baking, cheesecake slice recipe, comfort food, dessert, family recipe book, family recipes, food, friendship, gluten free baking, gluten-free dessert, passionfruit recipe, passionfruit slice by Cauldrons and Cupcakes. Bookmark the permalink. Wow I will need to give this one a go. Yes, the memories and the love are what makes these dishes extra special. Thanks so much for connecting! Awww man, I so want to make this. So many indulgences in one place. I really need to hunt out an alternative to condensed milk – it’s the consistency and how it reacts as much as the taste that is the challenge. This may up my searching. You’re lucky and blessed to have these recipes. My (Sicilian) Nana refused to write them down and we had to watch as she did it. The only one I have left imprinted in my brain is the pasta sauce. Alas, the crostoli, ravioli, torrini, sausages and stuffed chicken have been in the ether. I have a cousin who we talk about the flavours and have been attempting to do (mostly in November/December for Christmas) but we haven’t go there yet lol. Slowly but surely we may find it (and we insist on our parents tasting to see how close we’ve got). On the condensed milk front, why not substitute a cup of ricotta or cream cheese and some sugar or sugar substitute like Natvia. Beat one egg yolk through with the cheese, cut the lemon juice in half, and then fold the passionfruit and stiffly beaten egg white through to lighten the mix. Bake, and adjust cooking time if it needs a little longer. You could also double the topping I suggested if you’d like a thicker passionfruit layer. Thanks for the alternatives but alas, they are all cow products, mmm, ricotta (adored that plain baked and then eaten with crackers while hot). Will investigate vegan versions (as some soy have casein <– my personal devil demon). Will jot down the alternatives for future reference. Fantastic story, and I look forward to trying this (if I can find somewhere to get passionfruit!). 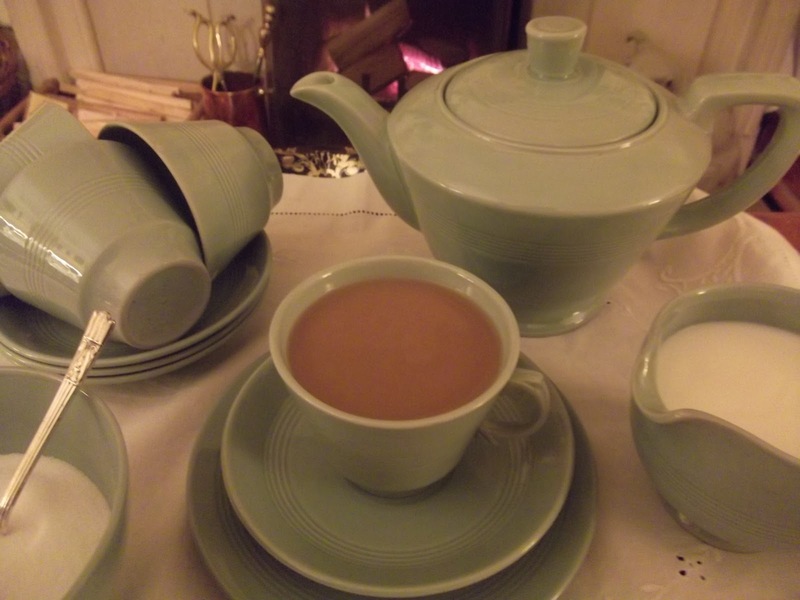 This line “There’s a lot of comfort to be had in a cup of tea and a slice.” brought me to tears…. hmmmm. I was just visiting elderly and absolutely delightful relatives (78 and not a day over 10yrs old if you ask me) and we had ginger cookies and the smoothest ginger tea just after they brought us home from the train station. Though I’ve been there only 3 times, their house felt like home to me. I miss them so much and only just left today. Tried this out last week and it is absolutely delicious and so easy to whip up. Thank you for a wonderful recipe! Just found your recipe on a google search-it sounds absolutely delicious, but why wouldn’t it if it came from someone called Dulcie. That is my name but it is rare to hear of it being given to anyone these days. It means “sweet”. I was named after my aunty who was named Dulcie. Will make it to take to my daughter’s next weekend so will let you know how it turns out. I am baking this in my oven smells sensational, cannot wait to taste!! I live in New Zealand and we are just picking our passion fruit. 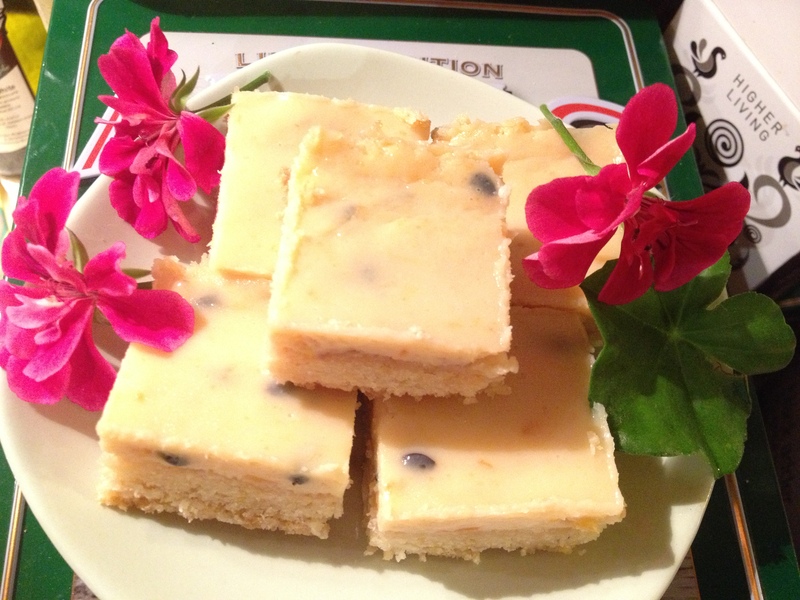 So I was searching for passionfruit slice recipes, when I found your one of your nana’s. It looks really decadent for a treat. The problem is that my husband hates coconut!! Could I substitute rolled oats or have you another suggestion? Ground almonds have been suggested but are too expensive! Hi Lindy, yes, just add some more oats or flour. Hopefully he’ll be happy with that. Enjoy! Hi, Ann from N.Z. I have just taken this devine slice out of the oven (I needed a moorish dish for a meeting tonight) just perfect & a bonus I used frozen passionfruit thawed from our vine. Many thanks I will be making this heaps !!! Hi Nicole, Just found your blog site and slice recipe when googling today. We have a glut of passionfruit and lemons at the moment so had to make this recipe to use up some of them. It’s wicked! I can see we will just have to force ourselves to bake and eat more of this slice until the end of the passionfruit and lemon season – no point in wasting them is there? 😉 Thank you for sharing you Nana’s recipe. 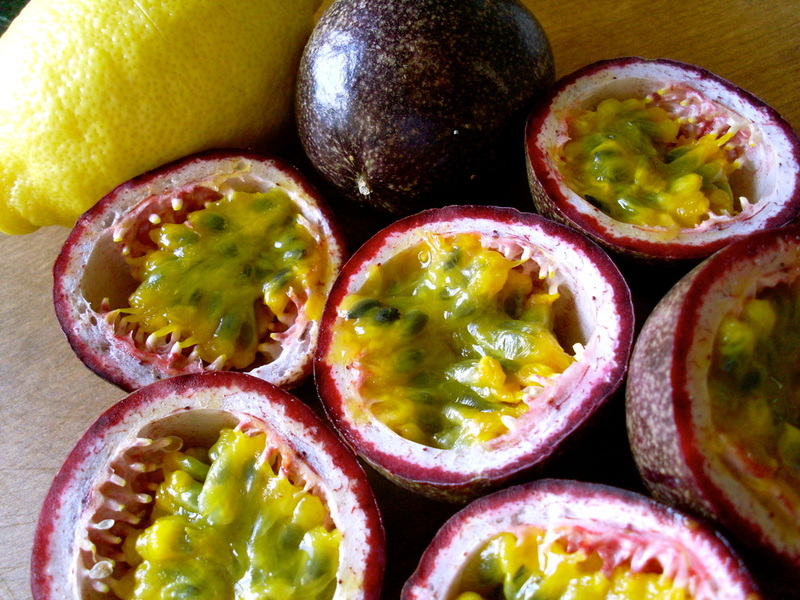 Just off to bake a batch now after been given lots of fresh organic passionfruit…delish! Absolutely delicious. It ticks all the boxes. Simple is so often better than a deconstruction. Well done Nanna, many thanks for sharing.